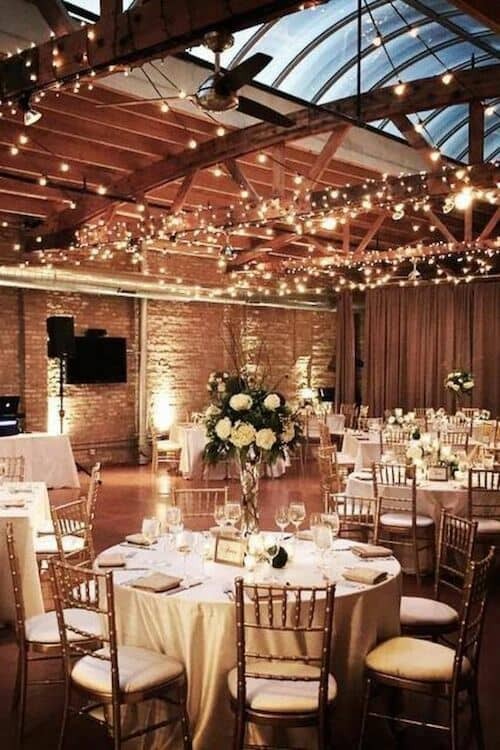 Create the most incredible wedding reception lighting ideas with lanterns, candles, LED and string lights, hanging light bulbs, neon marquis and lighted arches. 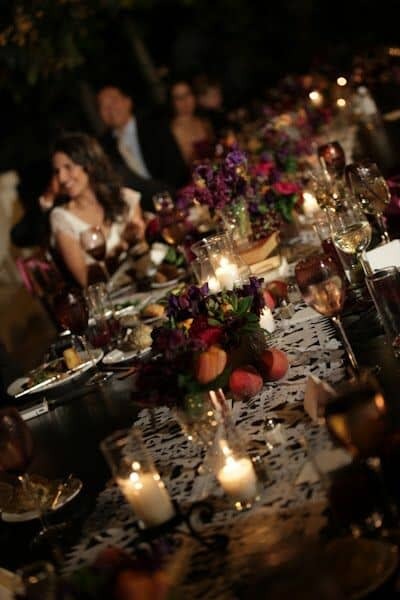 Creating the appropriate lighting mood can make or break your wedding reception. 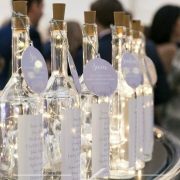 Check out these original ideas to illuminate your wedding! Delight your guests with a spellbound romantic evening or let them bask in the warm glow of a fairytale ambiance. Twinkle, twinkle little star… nothing casts a more magical spell on an evening affair than properly and purposely installed lighting. But if you ever tried to decorate your house with lights for the Holidays then you know it’s not so simple a task. 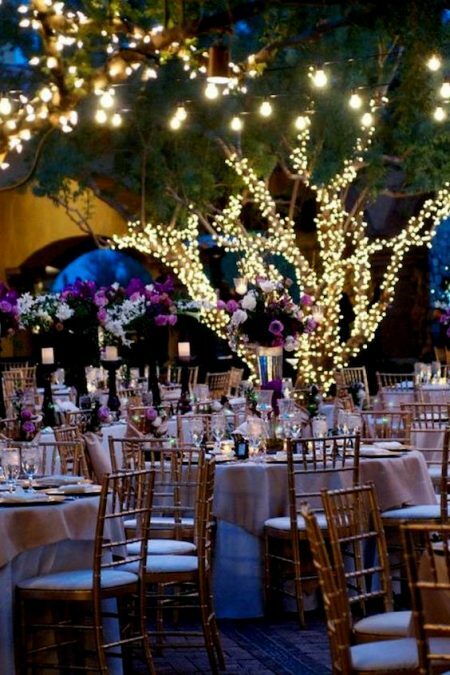 These wedding reception lighting ideas range from the simplest to the most elaborate for both indoor or outdoor events. Simply pick the one that suits you best or get inspired by all of them! 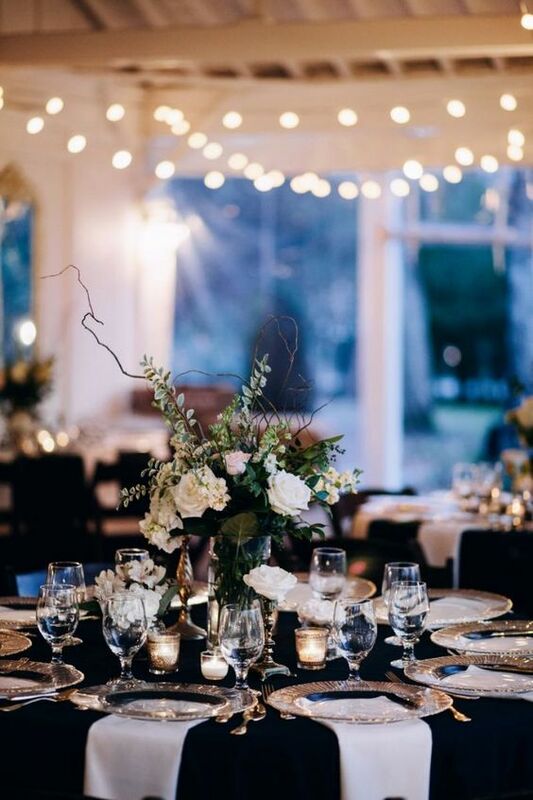 Add glam to your reception decor with a mixture of lamps, votives and bistro lights. Notice how the clear tent that covers this patio reflects the market lights’ gleam thus creating a festive and cozy mood. Love how the gold of the candelabra centerpieces and chairs add even more warmth to this romantic bistro wedding reception lightning idea. As above, so below, the centerpieces and votives match as well. 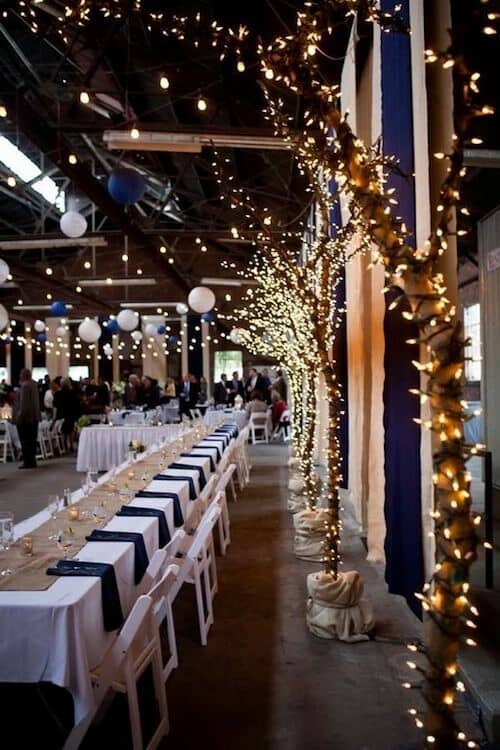 An extremely well orchestrated wedding reception lighting idea. Are you up to the task? 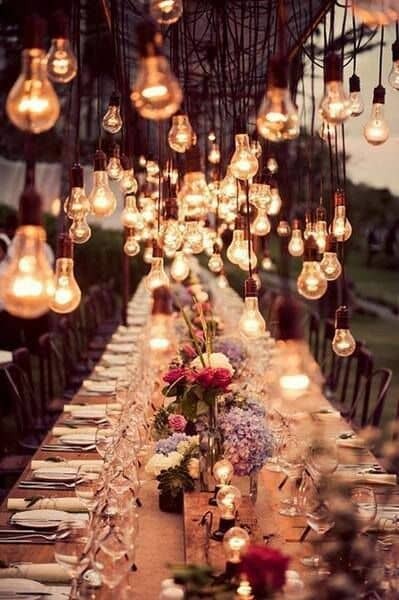 Romantic bistro wedding reception lightning idea. 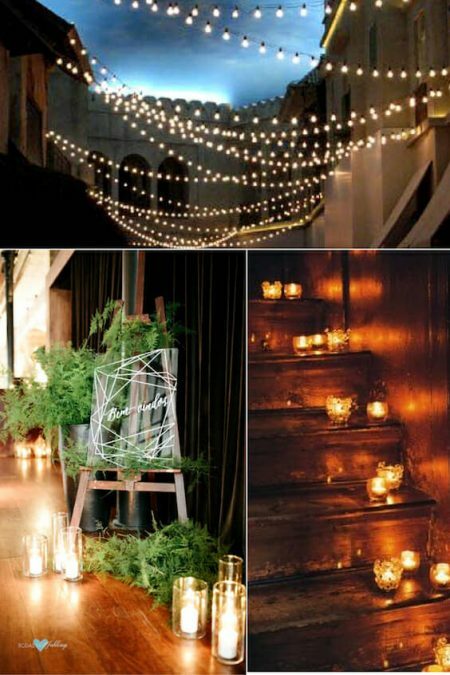 For a beautifully illuminated decor, hang string lights and draped tulle off the venue’s beams forming an entryway. 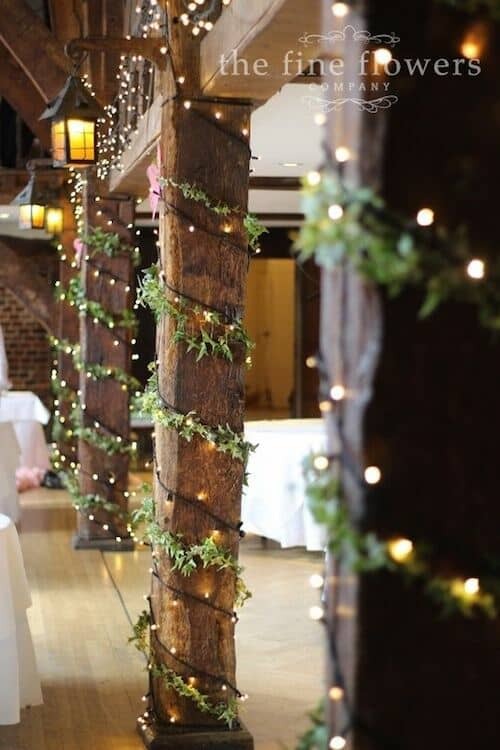 This is an easy wedding reception lighting idea to implement at any venue with exposed poles, pipes or beams. 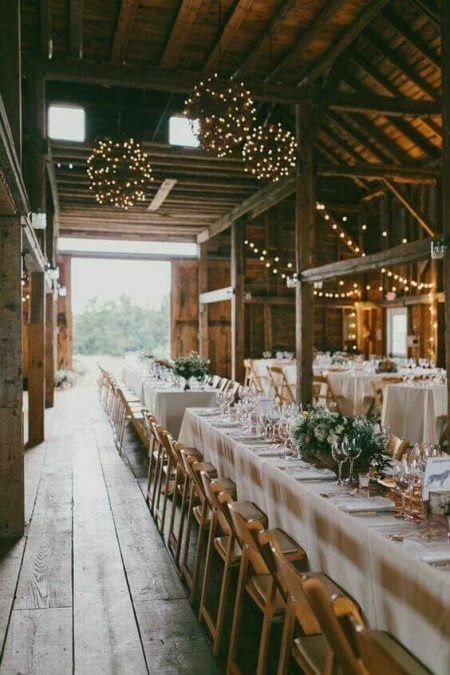 So, don’t limit yourself to a barn, it could be the perfect idea for the raw space of an industrial venue! Photo by Amy Horn photography. 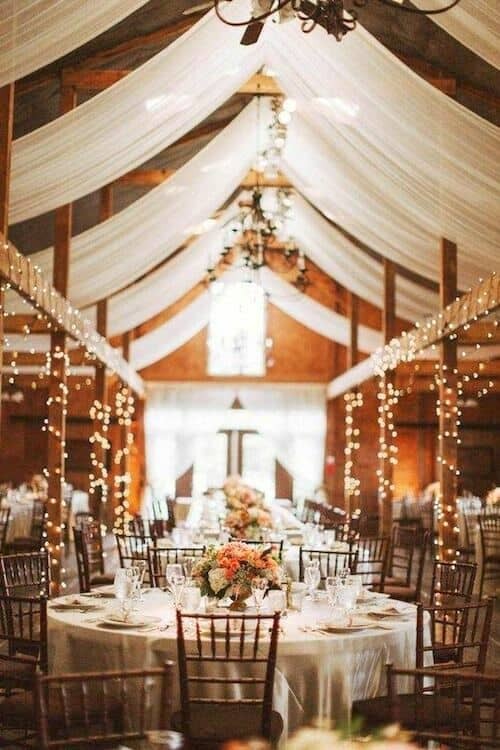 Market lights and draped fabric wedding reception lighting ideas. Yes, your venue has the coolest chandeliers. 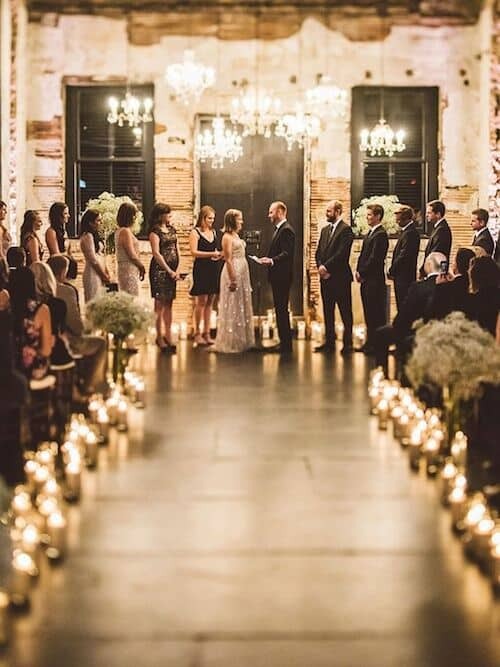 Then rock your ceremony photography and ambiance by lining up electric candles with the pews. An ultra romantic industrial wedding theme very much on trend. Candlelight and chandeliers for ultra glam industrial romance. 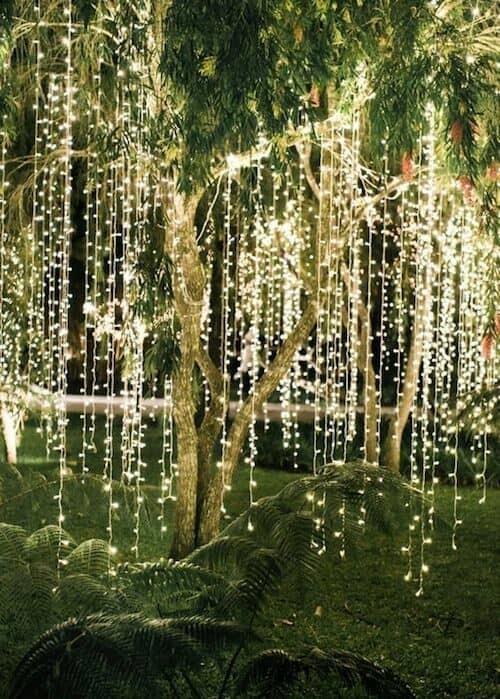 Swoon-worthy outdoor wedding lighting ideas with romantic fairy lights on trees. Feel like decorating a tree for your wedding reception? How about a couple of them? These inexpensive and gorgeous wedding reception lighting decor ideas will amaze your guests. Remember that you will need a ladder or climbing equipment depending on the tree height. Choose your battles carefully. 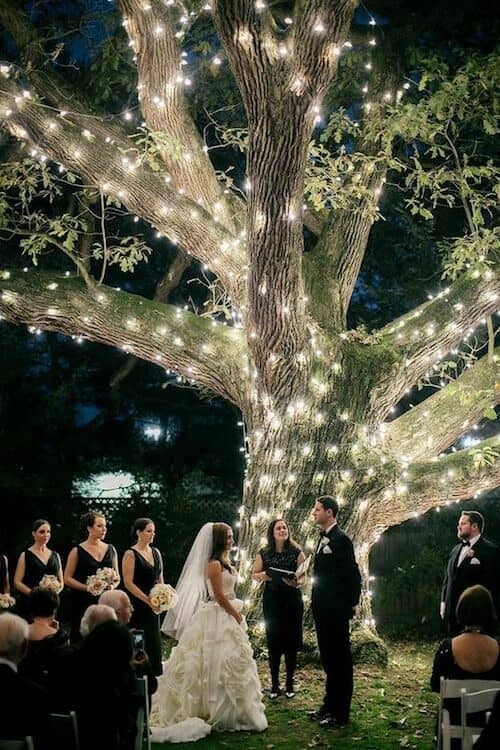 Awe-struck wedding reception tree lighting ideas. If you already have the tented space, hanging some flame retardant fairy-lights will turn your evening into a dream come true. 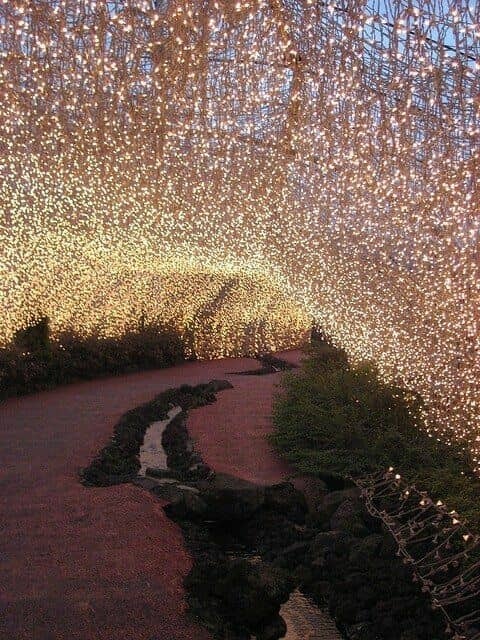 Imagine this setting at any outdoor wedding reception. 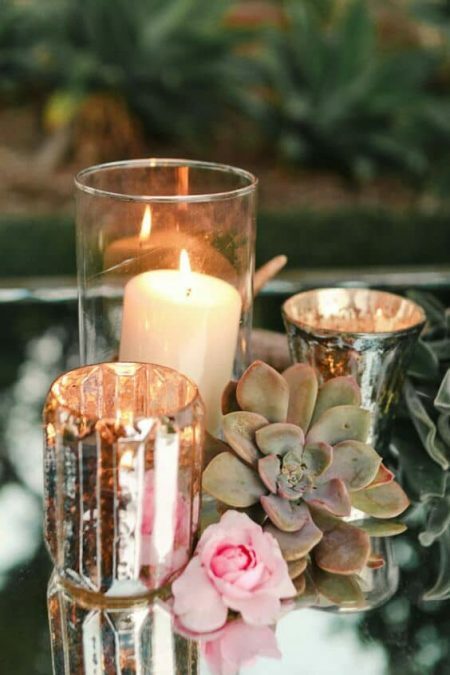 No main centerpieces are needed if you go for an arrangement of candles and votives. 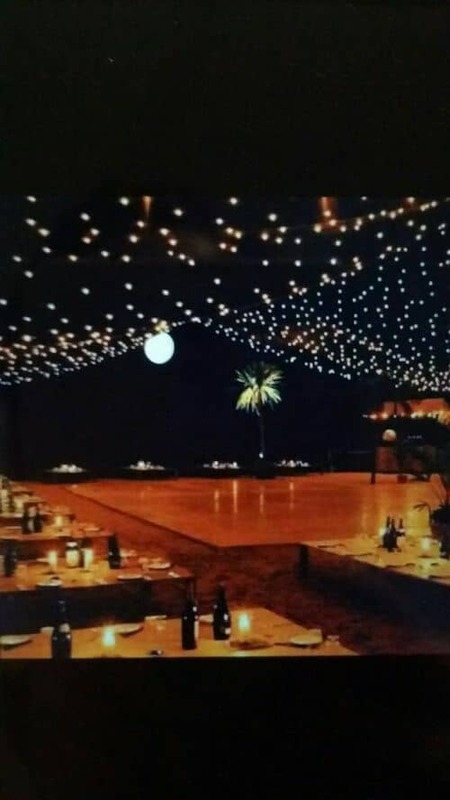 Tented outdoor beach wedding reception lighting. These string lights add happiness and warmth to the space. No need to worry about the heat of the lights against the draped fabric. For a more wintery or foresty feel, mix in some evergreens. 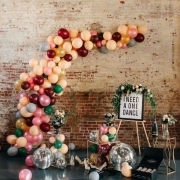 This is a wonderful idea to cheer up even the most seriously impressive reception venues. Cheerful wedding reception lighting ideas for a Virginia wedding. Nessa K Photography. Ivy and fairylights wedding reception at Great Fosters, Surrey, UK. A tree lined salon wrapped in Christmas lights is an easy and out of the ordinary way to decorate your wedding reception. For an added touch of fun, hang bistro lights and balloons across the room. Bring nature indoors and play with Christmas lights! This wedding lighting idea is more complex and difficult to execute properly. Many elements need to be setup and complement each other for the perfect lighting mood. 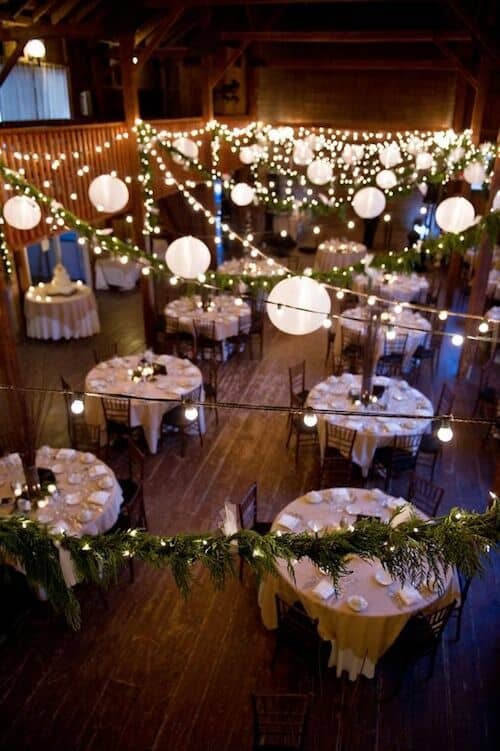 Round light balls over the tables, hanging streams of light over the dance floor, lighted centerpieces and bistro lights that tie up the concept. 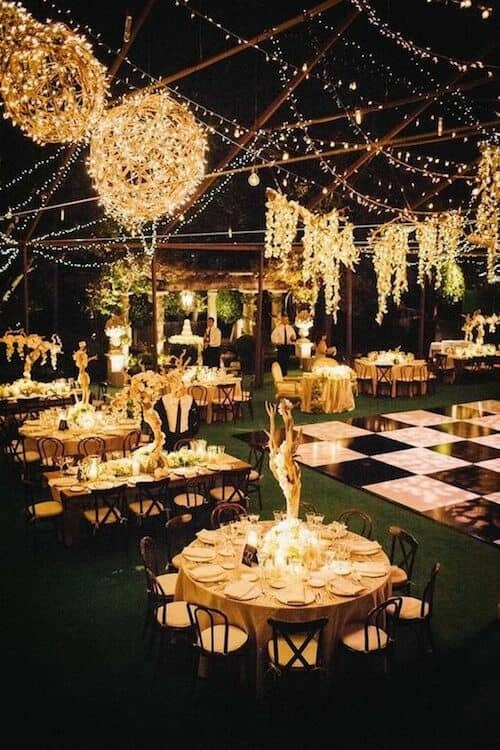 Creative ways to light your wedding reception. The warm summer breeze and, hopefully, a clear view of the night sky filled with stars, are part of this idyllic landscape. 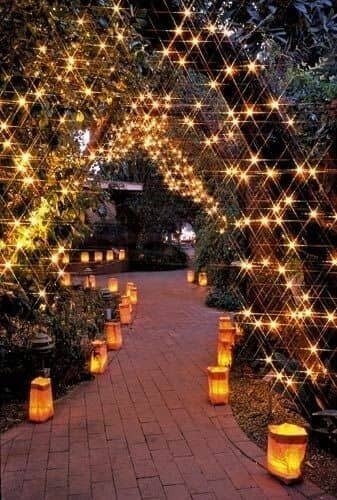 To decorate this almost perfect scenario with lights, use the surrounding trees to hang cable extensions with bulbs and hanging paper balloons. This craft is very economical and easy to do. 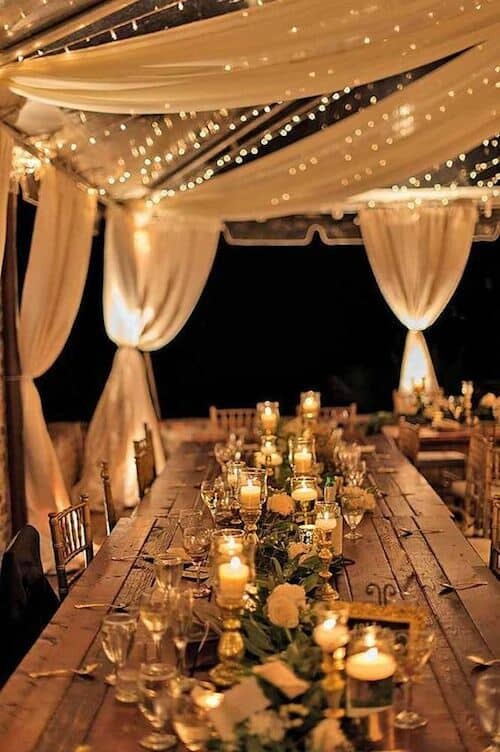 Cozy outdoor wedding lighting for a summer night. Cover some branches with string lights to mimic the winter scenery outside. A perfect idea for a lodge wedding. Score additional rustic elegance points with a fireplace. Brinton Studios photography. 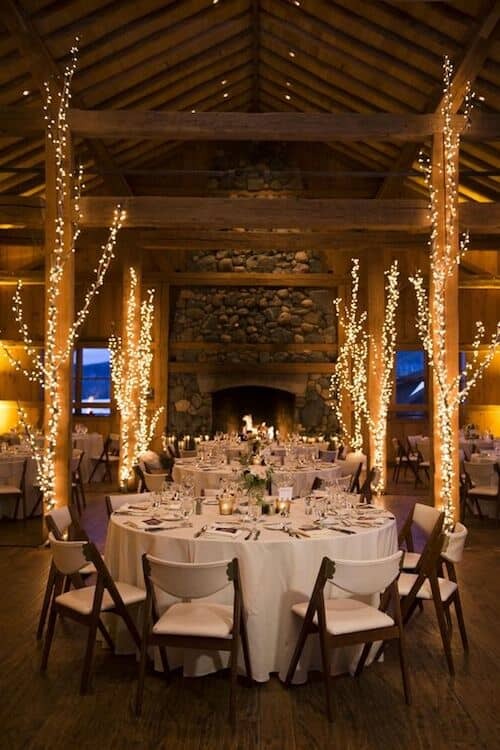 Winter wedding reception lighting ideas. Does your wedding venue have an upstairs you’d rather cover up? Complement your wedding decoration with lights, hanging paper lanterns and a mixture of natural elements. Quite simple to make, cheery and adorable. Cheery and affordable wedding decor ideas. Do you have an uncle who has hoarded lights and wires all through his life? Now is the time to tap onto his treasure. Go crazy mixing and matching different size and shape light bulbs around the venue’s beams. 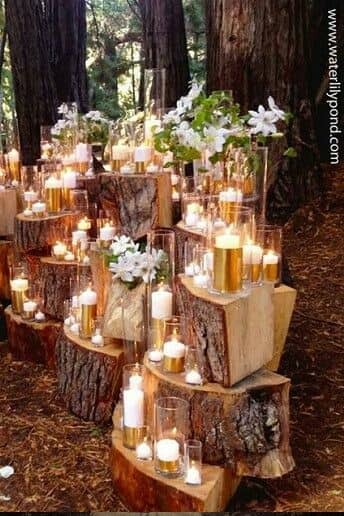 Groups of glittery candles, an extravagant centerpiece of encased tall candles, or hanging votives are some of the unique and stunning wedding reception lightning ideas you can craft. 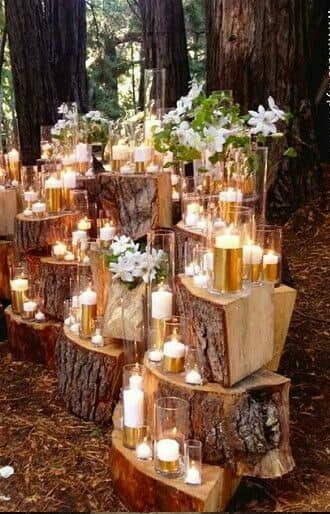 Candle lighting ideas for your wedding. The greatest thing about these lights is that they come on a transparent netting. All you have to do is hang them up. Shop around at Xmas time or shop online when it’s not the season to be jolly yet! 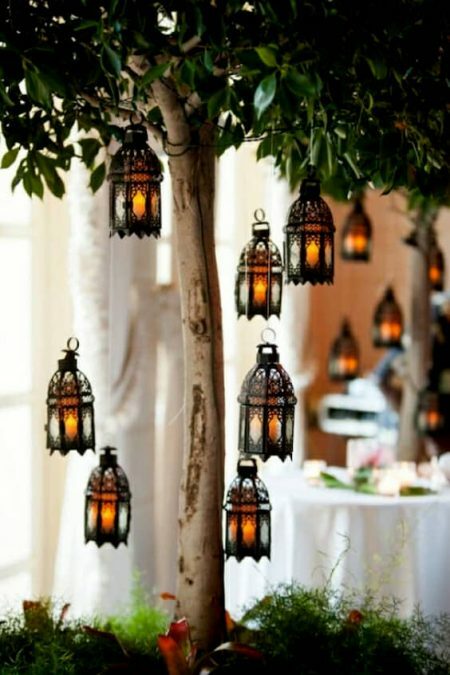 Magical beach wedding reception lightning ideas. 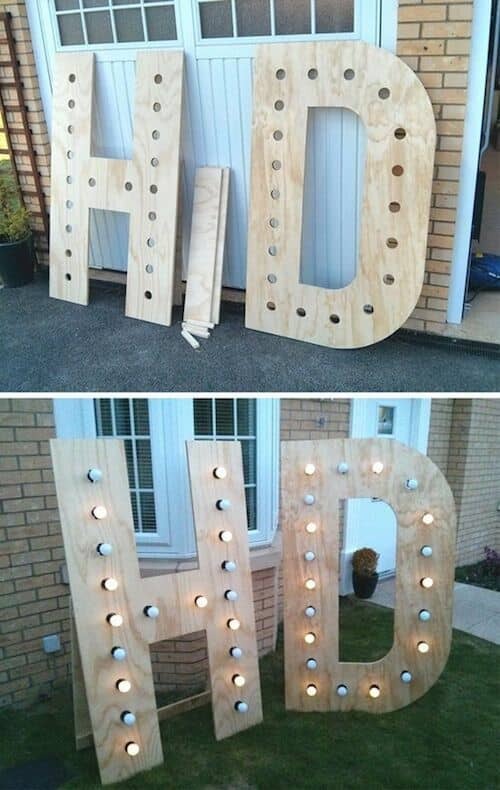 I love this crafty idea – especially for a modern or industrial themed wedding – of ultra large and lit bride and groom initials to welcome your guests. A nice battery pack will keep it going all night long. 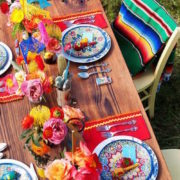 Unique reception welcome crafts you will want for your wedding. 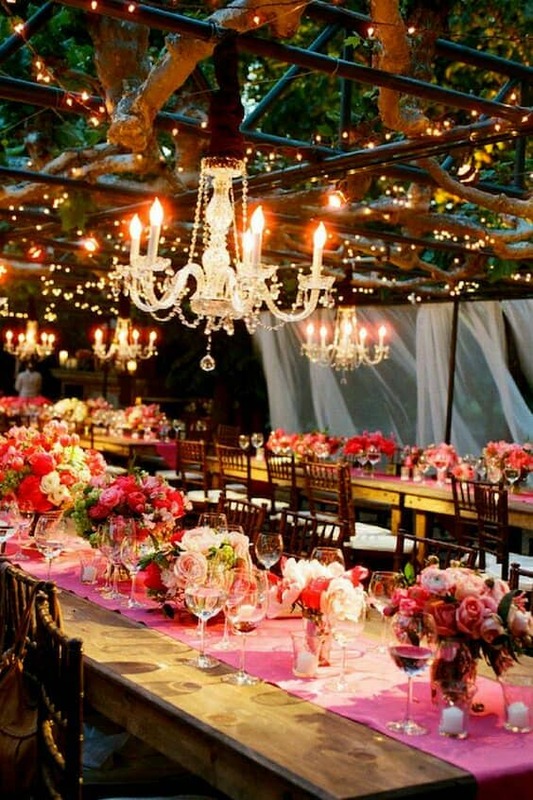 16Lighting ideas for fairytale woodland weddings. Steal-worthy lighting ideas for fairytale woodland weddings. Bring the forest indoors. 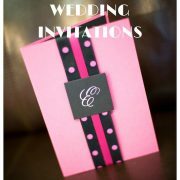 Cedarwood Weddings, Nashville, TN. 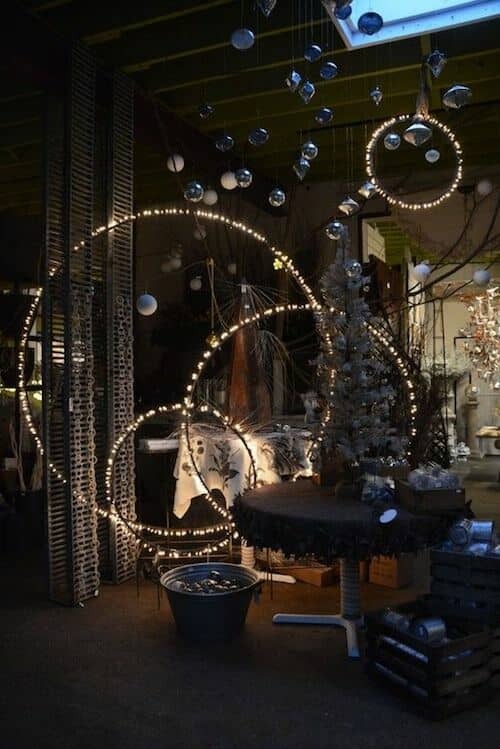 17Instead of hanging lights from a tree, wrap them around it to achieve this magnificent lightning effect. Pennsylvania wedding at Aldie Mansion. 18The following lighting arrangement is simply breathtaking. Hanging Christmas lights illuminating the path to the wedding reception. And this is a simpler version you can DIY much easily. 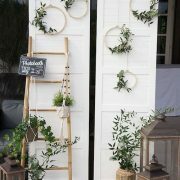 19Wedding wreaths are all the rage on 2018 so grab a few Hoola Hoops, glue some market lights and hang them from the ceiling at different heights. 20Ideas abound to decorate weddings with lighting elements, in this case hanging lightbulbs without screens. 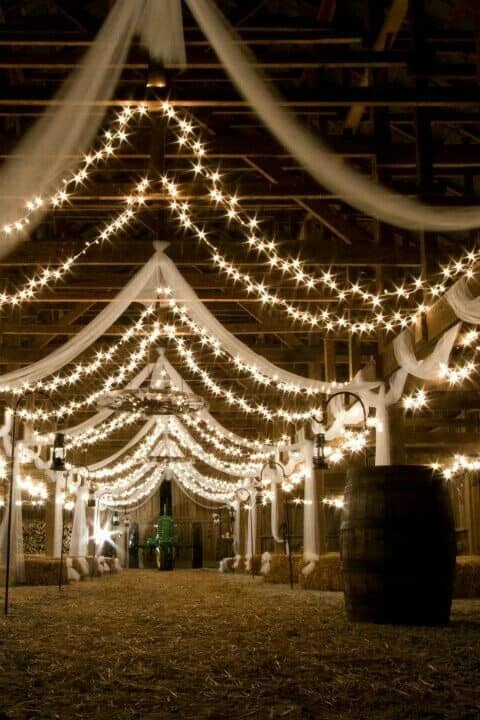 Original way to decorate your wedding with lights. 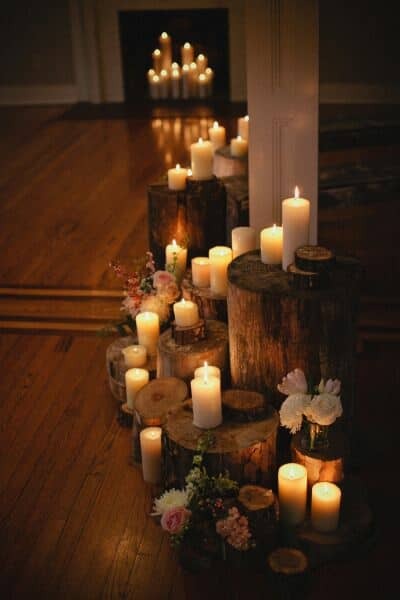 Boho folk weddings can leverage candlelight as well. Photography by stevesteinhardt. Remember to ask if the venue has a no open flame policy. You can always choose electric candles or LED candles. If you are planning on creating your own tulle netting with mini string lights, compare its cost to purchasing pre-made tulle and lighting swag garlands that is flame retardant. 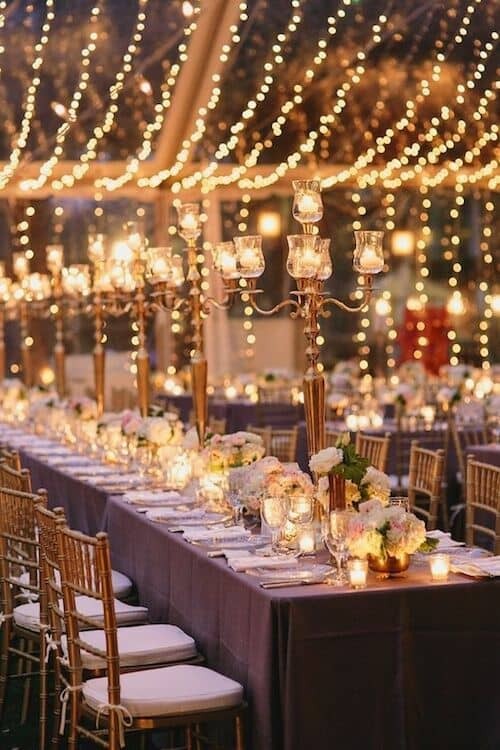 With a little inspo and easy to get materials, you can create the wedding reception lighting of your dreams. Now, from 1 to 20, which one is your favorite? Boda Ultravioleta: Como Usar (Sin Abusar) el Color del Año en tu Casamient... Tendencias en Invitaciones de Boda 2018: ¡Descúbrelas Aquí!